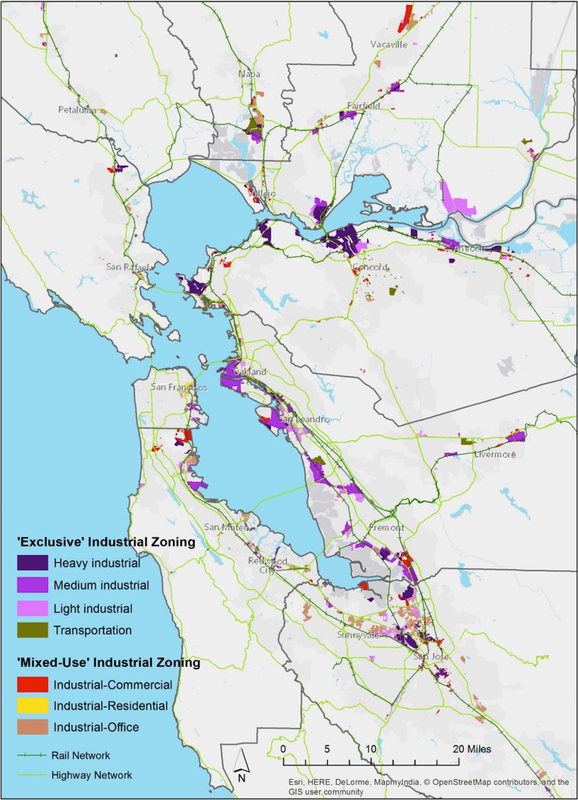 The amount of industrially zoned lands in the Bay Area is a relatively small share of acreage in the overall region, but the industrial uses of these lands are highly valuable to the region’s economy. Industrial uses generate middle-wage jobs which are an important contribution to job quality in the region. Patterns of employment both in the present and projected to 2040 indicate that middle-wage jobs are almost twice as concentrated on industrial lands as in the region generally. The activities and economic linkages of businesses clustered on industrial lands provide significant regional economic benefits, particularly in terms the dominant uses for warehousing and R&D. The region must carefully steward its lands zoned for industrial usages, both because they are in demand and because industrial uses have natural limits on the extent to which they can be made more productive through increased density. There is very little vacant industrially zoned acreage in the urban core where overall demand for warehouse and manufacturing space is increasing due to the rises in new modes of production, e-commerce, and just-in-time delivery. These uses in particular require relatively low densities, needed in part to accommodate parking, loading, and other surface uses, many in connection with warehousing. the lands are in areas—particularly those in the urban core—that are projected to have deficits of industrially zoned land by 2040. Although current analyses suggest that conversion of industrial lands is proceeding at a slow pace, industrial zoning conflicts with other general plan and Priority Development Area designations could increase conversions in the future. Especially in the urban core, since it is much easier to remove acreage from industrial uses than it is to create new areas of industrial zoning, the Bay Area’s industrial lands need to be viewed as a somewhat finite resource of particularly high value.